She spent 20 minutes sketching as I pontificated, not freaking out or getting flustered as I gestured and shifted my position several times. I directed her to include the couch, coffee table and picture window behind me. She arrived at a halfway decent drawing. I was impressed and told her so. I tried to teach her a observational technique I’ve use on other young students: study multi-figure photographs in order to figure out where the camera eye is or horizon would be if it weren’t completely blocked by all the objects in the photo. (If you can see the horizon, it doesn’t count). When I’ve tried this in the past, it tends to be difficult for the students, at least at first. Angie got it right away, not even working up a sweat. 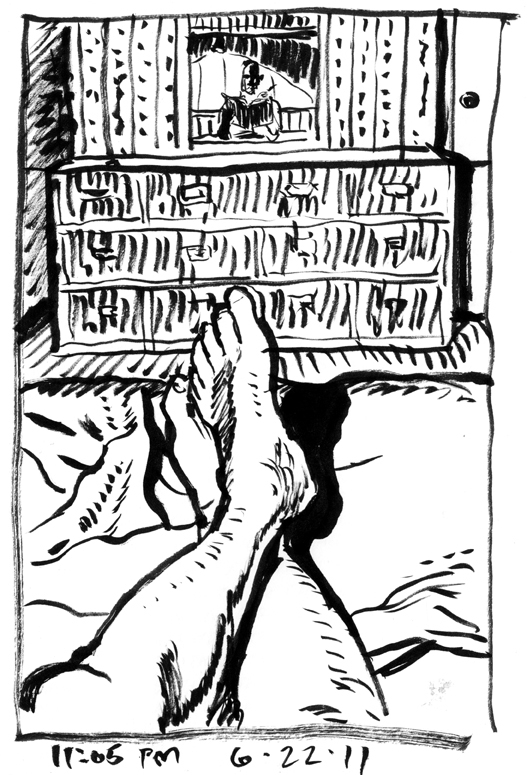 This drawing is a self-portrait of sorts, done while lying in bed in the bedroom I grew up using from age 5 to 17.